In a proof-of-principle study, researchers infused three patients with progressive multifocal leukoencephalopathy with T cells from healthy donors targeting the BK virus, which is genetically similar to the JC virus, and found that it reduced the JC viral load in the cerebrospinal fluid. Adoptive T-cell therapy was effective for treating progressive multifocal leukoencephalopathy (PML), a rare and often fatal brain infection that is associated with the JC virus and which is sometimes observed in patients with compromised immune systems. The results of the phase 2 trial were published in the October 11 issue of the New England Journal of Medicine. PML attacks the myelin sheath in the brain, and there is no effective treatment for it. Symptoms of PML are progressive and can include altered mental status, ataxia, motor deficits, and visual impairment, and are linked to immunosuppressive drugs or advanced HIV infection. Experts not involved with the study advised that the preliminary findings of the proof-of-concept study should be interpreted with caution, however, and that more data is needed before the T-cell therapy can be heralded a success. Dr. Rezvani and her colleagues at the University of Texas MD Anderson Cancer Center infused three patients with PML with T cells from healthy donors targeting the BK virus, which is genetically similar to the JC virus. Specifically, the researchers generated the bank of BK virus-specific T cells from 27 healthy donors and for each patient in the study, the most closely human leukocyte antigen (HLA)-matched T-cell line (meaning that at least one HLA-A and one HLA-DRbeta1 allele matched) was selected and administered at a dose of 2×105 T cells per kilogram of body weight. Researchers administered the infusions every four weeks until the virus cleared. Patient number one was a 32-year-old woman with acute myeloid leukemia who received a double-cord blood transplantation and for whom immunosuppression was discontinued seven months after transplantation. Almost two years post-procedure, the patient experienced weakness on her left side, slurred speech, and confusion. She had dysarthria, a severely ataxic gait, and was unable to stand without help, according to the report. Her CD4 cell count had been 100 to 150 per cubic millimeter since engraftment of the stem-cell transplant. After the first infusion of BK-specific T cells, the patient's viral load fell from 700 copies to 78 copies per milliliter, and her neurological symptoms resolved with the exception of slight dysarthria. With two additional infusions of the T cells, the JC virus cleared in accordance with clinical and neuroimaging findings. This was true two years after the last infusion, according to the report. The second patient was a 73-year-old woman with JAK2-positive polycythemia rubra vera that had been treated with ruxolitinib for eight years and who had a six-month history of progressive confusion, expressive aphasia, blurred vision, and ataxia. Her MRI tested positive for PML with a JC viral load in the CSF of 230,000 copies per milliliter. Ruxolitinib treatment was discontinued, and two months later, the patient was treated with BK virus-specific T cells. After the first infusion, neurologic symptoms stopped progressing, and findings consistent with immune reconstitution inflammatory syndrome (IRIS) were seen on MRI. She received a second infusion that was associated with further reduction in JC viral load in the CSF, to 800 copies per milliliter, and there was no improvement in clinical status or findings on imaging. She pursued hospice care and died eight months after the first infusion, according to the report. Patient three was a 35-year-old man with acquired immunodeficiency syndrome (AIDS) who had discontinued highly active antiretroviral therapy (HAART) five years earlier due to the side effects. The JC viral load in his CSF was 4,300 copies per milliliter, the CD4 cell count was 116 per cubic millimeter, and the HIV viral load was 66 copies per milliliter. Post-infusion, he experienced clinical improvement, was able to sit unaided which had not been possible before the infusion; he also had less dysarthria and better coordination, and findings consistent with IRIS were seen on MRI. After three subsequent infusions, the JC virus cleared in the CSF. He regained independent mobility, and there was a reduction in the size of MRI signal changes. Nine months after the first infusion, the patient was able to walk with a cane and had minimal dysarthria. The study authors confirmed migration of the T cells to the CNS, as reflected by their appearance in the CSF of the first patient. “This finding shows that third-party HLA-mismatched allogeneic T cells can cross the blood–brain barrier, survive, proliferate, and putatively mediate an antiviral response,” they wrote, further adding that there was no graft vs host disease noted in the patients as in previous studies, which they considered a major success. Dr. Rezvani noted that in the second patient who died in hospice, it was difficult to tell whether her lack of clinical recovery could have been due to permanent damage to her brain from PML, or whether the T cells did not induce sufficient recovery. “As we treat additional patients, I hope that we will be able to differentiate those patients who do not respond because the brain has been irreversibly damaged from the JC virus and those in whom the cells do not work,” she said. “PML can be a brutal disease when it goes unchecked, so the notion that one could bring a set of T cells out of the freezer and match them to the virus is very attractive,” said David B. Clifford, MD, FAAN, Melba and Forest Seay professor of clinical neuropharmacology in neurology at Washington University School of Medicine. He noted that the three patients described in the report were very different from one another in terms of the underlying disease that triggered the PML. For instance, he noted, “a majority of patients with HIV and PML who are given just their HIV therapy and good care can survive PML these days.” Therefore, in regard to the man with AIDS in the case report who rebounded from PML, it would be impossible to attribute that recovery to the BK virus-specific T cells, when it could have been due to the highly active antiretroviral therapy instead, Dr. Clifford said. He also pointed out that the first patient in the case report, a 32-year-old woman with acute myeloid leukemia, had an “effective immune response taking place at the time of diagnosis” and before the T cell infusion, which possibly could have meant that the patient would have survived the PML without the therapy. “The T-cell treatment would need to be administered in a greater number of patients and in patients with poorer baseline immunity to truly know more about whether the experimental treatment was helpful,” Dr. Clifford said. He noted that there is “ample evidence” that the immune response against JC virus is critical for the containment of PML but pointed out that the authors did not test for the presence of JC virus-specific T cells in the three patients prior to the first infusion. “Furthermore, immune recovery occurred in all three patients, caused either by discontinuation of immunosuppression or by starting antiretroviral medications,” Dr. Koralnik said. “Patient number one presented with IRIS prior to the first infusion of BK virus-specific T cells,” he continued. “Regardless of therapeutic effect, this paper also illustrates the importance of quality of life issues in PML, as one patient opted for hospice care despite apparent stabilization of the disease. Further studies on larger groups of patients are warranted to determine the efficacy of this novel treatment modality for PML,” he said. Dr. Major said the fact that there were no graft versus host interactions, and that donor cells were found in the CSF long enough to travel to the brain, were important findings. But he added that he would have liked the study to address the longitudinal tracking of viral load assay used to determine presence of JCV DNA in the CSF, among other points. It is important to track the amount of JCV virus in the CSF of the surviving patients to ensure that clinical features of PML do not return in the future, he added. Dr. Major said he was not clear why researchers used BK virus-specific T cells when they stated that anti-JCV peptides also stimulated T-cell activity. “While there is nearly 75 percent genome similarity between BKV and JCV and published evidence that there is T cell cross reactivity, unlike serological cross reactivity, using T cells directed uniquely to JCV might show even greater responses to JCV in the brain and any reservoirs in the periphery like lymphoid tissues and kidney,” he said. The researchers received funding from the Myelodysplastic Syndromes and Acute Myeloid Leukemia Moon Shot and the National Institute of Health. Dr. Rezvani disclosed grants from MD Anderson Moonshot for AML/MDS. In addition, Dr. Rezvani has a patent pending with Optera in a joint venture between MD Anderson for rapid generation of super-potent BK virus-specific T cells for the treatment of BKV infection and progressive multifocal encephalopathy, but she received no funding for the current study from Optera. However, MD Anderson is in discussions with Optera to license the BKV CTL product in the future. Dr. Major has received honoraria from Biogen/Idec and Novartis. •. Muftuoglu M, Olson A, Marin D, et al Allogeneic BK virus-specific T cells for progressive multifocal leukoencephalopathy https://www.nejm.org/doi/full/10.1056/NEJMoa1801540. N Engl J Med 2018: 379 (15):1443–1451. 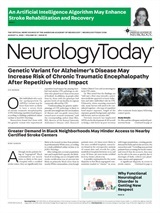 Neurology Today18(22):14-15, November 15, 2018. In the Clinic – Headache: Is the Correlation between Low Vitamin D Level and Chronic Tension-Type Headache Clinically Meaningful?